Everyone loves an underdog story. Rather a story about someone defying the odds. A story of hope. Though we may not see the success in the end, knowing that there will be a happy ending when the curtain falls is equally as satisfying. In what could easily be considered the underdog musical of the festival, Single Wide, with music and lyrics by Jordan Kamalu and book and additional lyrics by George D. Nelson, follows the denizens of a trailer park when a mysterious stranger finds his way into their community igniting a flurry of change. 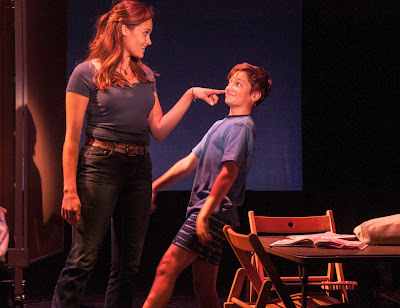 Set in a trailer park in the south where a humdrum life is status quo, Single Wide is a story about young mother Katy who wants nothing more than to get her son Sam out of the community and the life he is destined for. When Guy, a recluse, rents the newly abandon trailer, Sam instantly forms a bond with him causing Katy to form one too after playing matchmaker. Is this stranger her someone special and Sam’s ticket out of this life? The story by George D. Nelson is an incredible examination on individuals that rarely get a real depiction. And with his strong characters, he creates incredible relationships. Single Wide is by no means The Great American Trailer Park Musical. The characters in Single Wide are real and have unbelievable depth. And that is just one of the many reasons why this show is so special. These characters may be considered “trailer trash” but they are not trashy. They are not stereotypical hicks. They are genuine people who are stuck in an unfortunate living situation. From Katy, the young mother with the young son, to her mother Amanda, who too was a young mother, to the resident hussy Flossie, these women in their own right are strong. They have a strong will to fight for what is best for them and the people around them. And then there is Guy. Guy has a secret. The reason why he is in this place in this moment. Without giving anything away because the subtle way it unfolds is beautiful, the character Nelson has created is so rich with history. There have been many depictions of similar characters on stage that don’t seem real. Guy is genuine. With such strong characters, the bonds that these characters have with one another is, with perhaps one exception, equally strong. 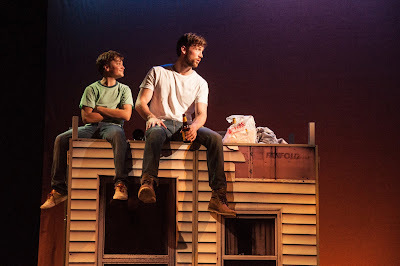 The most dynamic relationship in the entire musical is between Guy and Sam. Sure, it’s a little “About a Boy” but their instantaneous gravitation is so tender and authentic. When Sam plays matchmaker, you not only want Guy and Katy to get together for their sake but you truly want Guy to be the male figure that Sam looks up to. And their number, “While You’re Young” is one of the many musical highlights of the production. Even the parental-child relationships of the story are stunning. Both mothers want their children to have big dreams and achieve them. And they will make sure that it’s a possibility. Even if it means running a phone-operated pet shop. With such a strong foundation to build on, the story is in decent shape but could use some finessing. Due to the pacing of storytelling, the build between Katy and Guy is rushed. It can easily begin sooner to allow their romance to flourish naturally. The second half of the story, when a real character conflict develops, feels a bit soapy. Figuring out a way to avoid that, even if it means changing the conflict all together, will aid in the second half of the libretto. Nelson has two neighbors, Ali and Freddi, that definitely want to be expanded. There is a brief line of dialogue where Ali reveals something about someone finding her that doesn’t get addressed again. Unlike many musicals, Nelson has the room to layer this in. Single Wide deserves the possibility of more content. It’s evident that the libretto is strong. But can you believe that the score is even more incredible! Jordan Kamalu’s score is contemporary country pop. It’s so good, Kamalu could easily have some of the numbers played on country radio today. Kamalu brings a wonderful blend of uptempo and ballads that allows for a wonderful musical arc. There are many showstoppers but it’s clear that Kamalu has intended one to be the show’s eleven o’clock number. And lyrically, that number should be reexamined. “Microwave Life” is Katy’s moment of vulnerability. With such an emotional moment for the character, the lyrics Kamalu uses are a bit corny and unintentionally funny. By adjusting some of the words, he could change the title and story to “Single Wide Life” and turn this song into something historic. It’s such a joy to watch well-written characters be brought to life by gifted actors. The company of Single Wide was a quality bunch. Of all the characters in the show, Katy is one of the more restrained personalities but Emma Stratton brought such soul to the role. Stratton should thank Kamalu for her material as she gets to show off her colossal pipes numerous times. Derek Carley, like his character, is full of mystery and when he unravels it’s truly remarkable. As Guy, Carley does not fall into the traps set by the stereotypes allowing his character to have human connections that are tangible. As Flossie the floosy, Jacqueline Petroccia shines. As the primary comic relief, Petroccia captures the character effortlessly. Like Carley, Petroccia avoids making Flossie a dumb character. There is substance behind her performance. And if there is anyone in this ensemble who should put out a country album, Petroccia is the prime candidate. Just reference “The World Revolves Around Me.” Remember these three. They will be superstars. Quality young actors can be hard to come by. Fortunately for Single Wide, Matthew Miner is good. Miner played Sam earnestly. He hit his beats with ease and truly had an incredible bond with each character. Stacia Fernandez as grandma Amanda performed like the veteran she is. Fernandez was a great matriarch and nailed all of her one-liners. Sincerity was key for this musical to work. Thankfully director Jeff Whiting guided his actors effortlessly on their emotional journey. It was clear Whiting focused on the character work. The only struggle Whiting had was the rules of movement within the trailer park. The set by Jason Ardizzone-West was quite stellar. The two units with the trailer photo panels allowed the audience to get the sense of the world. But Whiting had difficulty defining the entrances and exits and the interior and exterior. It was a bit messy but you can completely forgive this after everything he did right. Costume designer Sarah Cubbage easily transported the characters into this world. Even with the vivacious Flossie, the costumes felt natural on the characters. Jordan Kamalu wrote a beautiful score. But it was amplified by the flawless orchestrations. This score sounds drastically different just on piano. Let’s be real, you can’t have country music without a guitar. And the addition of the guitar, bass, and drums gives it the country vibe that truly sets it apart. If you can’t tell by now, I can’t stop talking about Single Wide. It got me excited. Like the story, there is so much hope in this musical. The contemporary country music genre doesn’t quite get the respect it deserves in theater. Single Wide is here to change that notion. For where it is, Single Wide is in good shape. Nelson and Kamalu have some work to do but it’s all for the better. Keep your eye on this one. When the moment is right, Single Wide will take theater by storm.